The words, written in big, white, Impact letters, caught my attention as I scrolled idly through Facebook a few months ago: IF YOU REMEMBER THIS, THEN YOUR CHILDHOOD WAS AWESOME. They were superimposed on an image that did instantly remind me of something: the SuperPlayground, a wooden play structure in a small park in my hometown, which was torn down and replaced several years ago. In the small, lefty community of Sebastopol where I grew up, in the wine country north of San Francisco, there were many playgrounds, but the SuperPlayground was everyones favorite. Whimsical details like a dragon slide, pyramid-framed swings, and pointed wooden towers separated it from the many plastic and metal pre-fab structures elsewhere around town. But best of all were the secrets the structure held: the wooden tunnels underneath it big enough only for young children, the corner where a PVC pipe embedded in the wall allowed you to whisper to your friend across the park. There were always places to hide and discover away from prying adult eyes. It seemed likely that someone from Sebastopol had created the meme. But to my surprise, the original image post had over 30,000 likes (and now over 76,000). Scores of comments enthusiastically identified the playground as Wonderland Park in Wasilla, Alaska, or Imagination Station in Roxbury, New Jersey. Small arguments erupted between people who were sure this photo was taken in different locations around the country. What was going on? Was this treasured childhood memory just another cookie cutter experience created for me by some corporation? 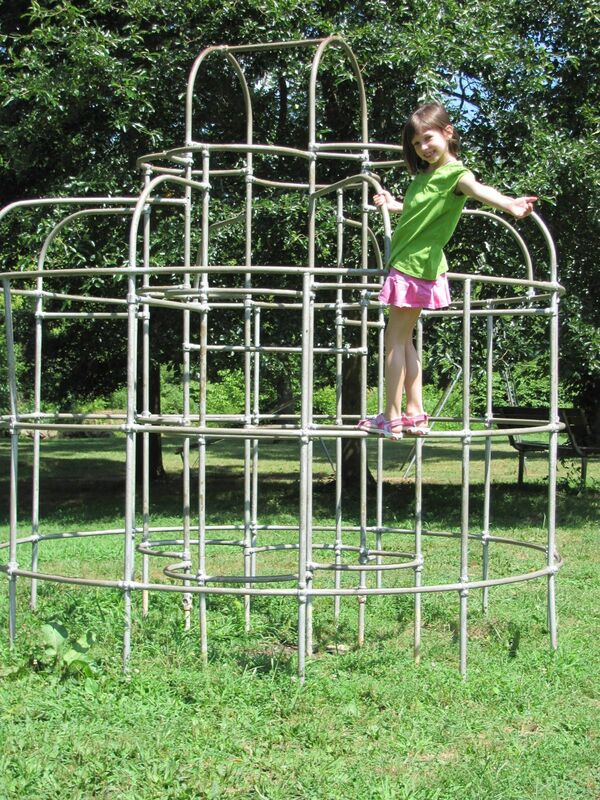 Going back even even further, I remember monkey bars, the one we played on back in daBronx wasn't even on grass, it was in a concrete playground. Sure we would get a few cuts and scrapes, but instead of lawyering up and looking for someone to sue, my Mom would clean us up and tell us to be more careful. Different times. I still found real playgrounds for my kids in rural Illinois. Cant forget the 20 high sliding board with real hot slippery metal to slide on. The best part, was learning to get onto the highest pole when at the top of that slide and then gradually let yourself down. It was neat, once you learned how to do it. Scary the first time, but after that; piece of cake and still fun. Only at the park, our school grounds only had swings and slide with a rock/pavement block at the end which caused major damage if you hit it.....lol Only needed to hit it once to never do it again! They had them in the park in East Orange, NJ in a large sandbox. The park was near the school where I went to Kindergarten. We moved out of East Orange before I went into the first grade. Now East Orange is a terrible place to live and the school is named after the crackhead Whitney Huston, who also went there. I remember when playgrounds had surplus steam locomotives, WWII tanks and artillery pieces in them. All this feeds right into my theory that America has been successfully terrorized. We're so afraid we're too stupid to teach our own kids, we send them right back to the same high school that made US stupid so we won't be alone in our old age of stupidity. It's all based on fear .... even President Trump's wall. Just about every law is based on the fear that someone will do something TO us or that we might do something to someone else and we have to be stopped or re-directed. How many of us have re-posted one of those " ... and we survived" type memes where we're reminded six of us drank out of the same NEHI bottle of grape soda, rode bikes without any protective gear, climbed and fell out of trees, broke our arms and had the girls feel bad for us, etc., etc. ? We went in to WW2 unafraid and came OUT unafraid. But somewhere around the 60's all of a sudden, social experts became god and they got clout in our political machine and .... well ..... here we are. Whats with the comment on trumps wall? Id love to hear your explanation. two words to describe an event within a more complex reply that I synopsized because I woke up out of a deep sleep and came here to tire myself back out so I can get more sleep. We went into WWII afraid of what the world would become if America did not fight against the Axis. Not all fears are irrational, or the result of mindless indoctrination. I repeat: We entered WWII because of fear - it was just a different and more courageous fear than many of these others. “Loose lips sink ships.” That is a fear-based motto from back then, and a valid one. Now they are located in “jungles”. Seen that vicious beast gather more than a few teeth. We had a “gigantic” tractor tire that we would climb all over, as well as some surplus concrete pipe pieces. I remember the 6 foot high metal slide on the dirt play ground and the brand new exciting push merry-go-round. Mostly we played marbles. This photo shows how we used the jungle gym back in the early-mid 1950s...if you locked your feet around the vertical pipes while hanging upside down you were safe as could be...doing situps from that position...oh my. At my elem. school we had a recess period to burn off energy between instruction sessions...playground activitywas essentially unsupervised with 2 or 3 teachers providing overwatch ( and some to sneak a cigarette) and wash cuts and scrapes with the dreaded but fascinating bubbling hydrogen peroxide. If you didn't have scabs on your elbows or knees, you weren't really having fun. You mentioned yur concrete playground, we had a blacktop areaaround the back of the school with a much larger fenced off grass area, guess where we played most of the time. Interesting. I spent a large part of my childhood in Sebastopol, but I do not remember anything like the author’s “Superplayground.” My mother would drop us off at the city park while she went shopping, and there was plenty to do there, but not like what the author described. Maybe “Superplayground” was after my time.